Some updates from Motor Trend for the One Lap of America. There are two Nissan GT-R's in the event , green and grey. 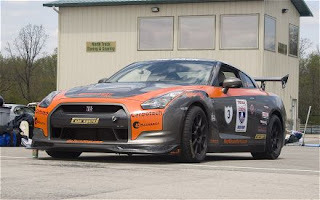 The grey GT-R sets a new wet skidpad record of 0.953 g putting it in first place. Rankins and Taylor return to the No. 1 spot, setting a 38.999-sec best lap on their third run at Turfway Park's autocross circuit in Florence, Kentucky.